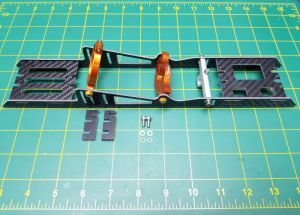 Carbon fiber rail style mount for 40mm diameter Motors with integrated lay down servo holder. Fits motors 40mm in diameter(depending on option picked) that are 74mm long and longer. For example Neu, Leopard TP and the other popular sizes. 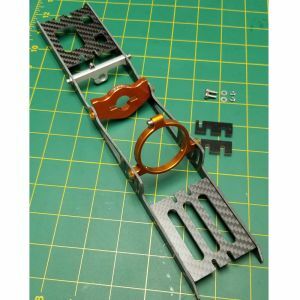 Additional rear motor clamp helps carry the weight of the longer 40mm motors. Angle is adjustable to allow straight alignment with propeller cable. 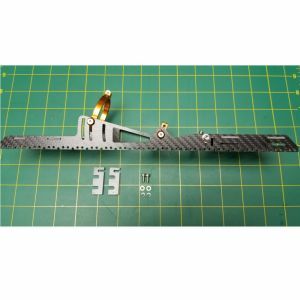 The aluminum mounting plate with extended Carbon Fiber mounting stands to distribute the weight of the motor over a larger area. The mounting plates that have holes drilled in the bottom to allow epoxy to flow into them to make a superior bond to the hull. This mount works only with deep vees. If will not work with a flat style hull bottom, like a hydro/ rigger or catamaran. NOTE: Distance between from and rear plate is 62mm, keep this in mind when ordering a water jacket for your motor. We suggest a 50mm long jacket.